mexican architect isaac broid has teamed up with chilean duo assadi + pulido to design a single-family residence that proposes an H-shaped scheme with two parallel pavilions. 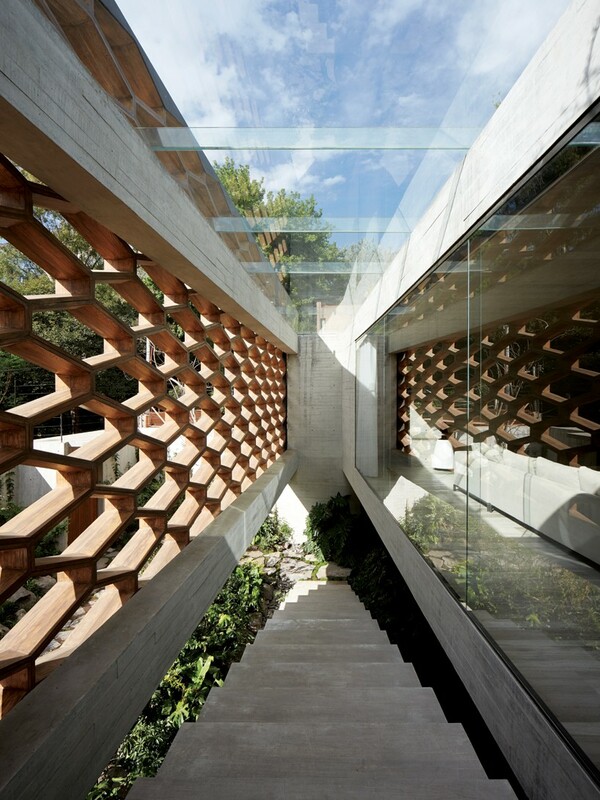 located in one of the most prestigious areas of mexico city, ‘casa roel’ shines with its simplicity and concrete grandeur. with an almost monochromatic appearance, the house was built with four materials: exposed concrete, glass, a beige stone for the flooring, and a light-colored wood on the ceiling. by placing it facing southwest, natural light flows through the whole plan that is set in only one level. 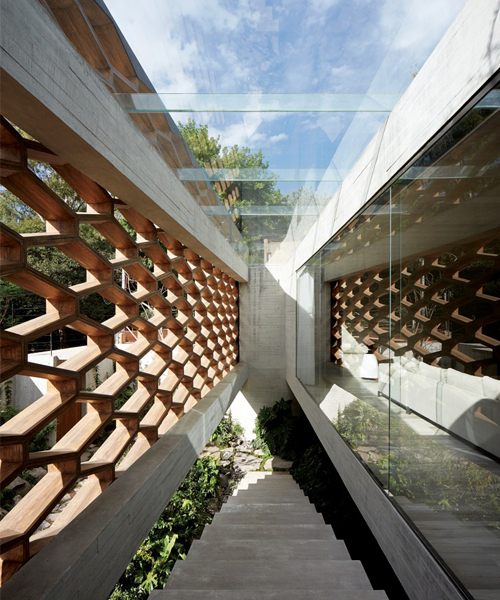 the house is composed of two parallel pavilions and one perpendicular that connects the other two. the one that is closest to the street contains the social areas, such as living room, dining room, and kitchen. its collateral pair in the background covers the bedrooms. the H-shaped structure is completely suspended, resting at the bottom of the site, that is sloped towards the street, generating different courtyards in the middle of the enclosures. a garden covers an area that goes from the street to the back of the lot, including space under the construction. on the rooftop, terraces were added with gardens, as well as a swimming pool. this area not only saves garden space but gives interesting views towards the roofs of the neighboring houses and to a good part of the city. ‘casa roel’ received third place in the single-family category of the local CEMEX building awards 2015.